All classes include refreshments unless otherwise indicated. Underlined indicates an Entry-level course, the main prerequisite being a professional background in health-care. Please click on workshop title for more information on that course. Bold type indicates class is open to registration. WAIT LISTED - This class is currently full. if you would like to participate in the class please do register for it but not send a deposit and we will put you next on the wait list. In the event anyone drops out the people on the wait list will be contacted in order. If no places become available when another course is arranged those on the wait list will have first priority for places. * VM1 study group open to all practitioners who have participated in VM1. Please email alison@barralinstitute.co.uk for details or to confirm attendance. ** VM2 study group open to all practitioners who have participated in VM2. Please email alison@barralinstitute.co.uk for details or to confirm attendance. *** VM3/Womens Health study group open to all practitioners who have participated in VM3 Pelvis OR Gynaecologic Visceral Manipulation course. Please email alison@barralinstitute.co.uk for details or to confirm attendance. **** VM4 study group open to all practitioners who have participated in VM4. Please email alison@barralinstitute.co.uk for details or to confirm attendance. *****NM1 study group open to all practitioners who have participated in NM1. Please email alison@barralinstitute.co.uk for details or to confirm attendance. You are advised to buy travel only once your place on a course has been confirmed. Course times will normally be from 10 - 6.30 first day with course registration at 9.30, 9 - 5.30 second (and third) days, 8 - 3.30 final day. This is to allow people travelling time and minimise accommodation costs. We have chosen Ayr as our Scottish base for courses as it is so easy to get to and in the warmest part of Scotland! 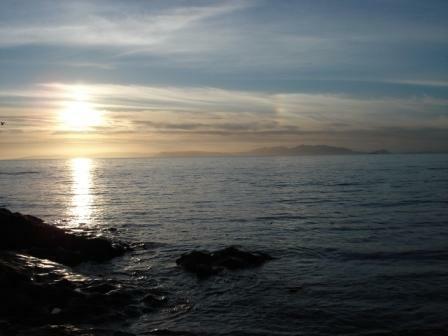 It also is a very pretty location with miles of sandy beach and views of the isle of Arran. Accommodation is cheaper and more plentiful here than it would be in a city and there are plenty of amenities and good restaurants. Ayr has excellent road and rail links, lying just 40 minutes outside Glasgow. It also is in the unique position of being within 45 minutes of two airports, flying all over the world. Prestwick airport is adjacent to the town with a direct rail link to the centre of Ayr taking under 10 minutes. It is the Ryanair hub for Scotland serving many locations in Ireland and Europe. Glasgow airport also has a rail link to Ayr which is linked to Glasgow airport by a 5 minute journey on a connecting bus or taxi and then train from Paisley Gilmour Street station directly to Ayr approximately every 30 minutes. The journey time is about 1 hour from the airport to Ayr town centre. We use a venue in the capital to serve those living in the south of England. We are close to public transport links and ensure ease of travel for those attending. Our venue is close to Euston station. Cancellations will be subject to a � fee if made 2 calendar months or more prior to the first day of the course. If you give less than 2 calendar months notice that you are unable to attend the class the full deposit of �0 will be forfeited. For classes taught by Jean-Pierre Barral or Alain Croibier personally the period for cancellation is extended so that a � fee is chargeable if made 3 calendar months or more before the first day of the course. If you give less than 3 calendar months notice that you are unable to attend the class the full deposit of �0 will be forfeited. www.direct.gov.uk/adultlearning or contact Careers Advice on 0800 100 900. Our learning provider registration number is: 20142. We are delighted to have completed the registration process and have gained recognition as an approved Learning Provider under the ELCAs scheme. Our provider number is 7623. Barral Institute UK aims to make Visceral Manipulation training accessible and affordable for practitioners in the UK. For this reason we try and keep the classes as low in cost as possible, whilst still ensuring a high quality product. Therefore we will tend to use cheaper venues where possible. We also will try and start and end classes to allow travelling time so it minimises time away from home for those travelling a distance. We aim to treat everyone fairly and as equals. Therefore we hold no prejudices and value any suggestions, ideas or feedback you may wish to offer us. If we can be of assistance in any way, please do contact us.